History, photographs, and music of the battalion. Maori Battalion march to victory! Official website with the story of the 28th; Map; Battalion Roll; Photos, video, and audio. A site dedicated to German armour with illustrations, tables of technical data, and a large number of links to other World War II sites. Some of the millions of photographs which were taken over occupied Western Europe by the Allies during World War II. Plans, pictures, facts and figures about the tunnels under Auckland’s Albert Park. Includes the Official Histories of the First and Second World Wars. History of the Third Reich and its allies - Germany & Austria, Bulgaria, Croatia, Finland, Hungary, Italy, Japan, Romania, Slovakia. Unit organisation for all major combatants up to battalion level. The Finnish-Soviet "Winter War" fought in 1939-1940. Info about the Canadians in WWII from the Juno Beach Centre. This site is devoted to the main tanks and AFVs either developed by the French war industry (or foreign vehicles used by the French army) from 1902 to the present day. Information about the chemical weapons stored in Australia during the Second World War. All about Italy's army, navy and airforce from pre-war to 1945. Links to lots of websites about Finland in WWII. Assault guns, light, medium and heavy tanks. This site is not intended as an overall review of the events of the Second World War. Quite the opposite, it is meant as a site for those who want to know about the aspects of WW2 that don't always make the history books. A variety of topics relating to France, Belgium, the Netherlands, and the BEF in 1940. The WWII section of a Russian military history website. A New Zealand group that portrays NZEF (Auckland 21st Battalion 2nd N.Z.E.F. ), Fallschirmjäger and Gebirgsjäger units. The Japanese navy during World War II, and detailed histories of individual vessels. The history of armoured fighting vehicles in New Zealand during WWII and more recent times. All sorts of information about the Battle of Kursk, right down to details of sun, moon and weather conditions. If you make a model of this you can play "The Big Push". Includes pictures of British, German and Italian forces. All fifty volumes of the Official Histories, initially edited by Kippenberger, which were published in the decades following the war. US Army order of battle prepared at the end of the war by the deployed combat historians assigned to the History Section, United States Army European Theater of Operations (ETO) in Paris. Organisation, Order of Battle, Aeronautics, Weapons, Decorations, Military Operations, Generals, Memoirs, Journals, Media Gallery, World War 1, Forum. The History webpages have an interesting collection of articles about some rather obscure WWII topics. The website also has an excellent collection of bibliographies, book reviews and guides to booksellers. German and Canadian newsreels of the Dieppe raid. Archives New Zealand's collection of official war art commissioned by the New Zealand Government, including the well known works of the Greek, Crete, North African & Italian campaigns in WWII done by Peter McIntyre, as well as a range of other artists depicting scenes from New Zealand's involvement in WWI and WWII. These artists include: Moore-Jones (WWI), Barns-Graham (WWII - Pacific), Welch (WWI), Butler (WWI), Coe (WWII - Pacific), Longstaff (WWI), Crippen (WWII - North Africa) and Clark (WWII - Pacific). There is also a section showing portraits of the New Zealanders who have been awarded the VC. Just in case you need the lyrics of the Dad's Army theme song. 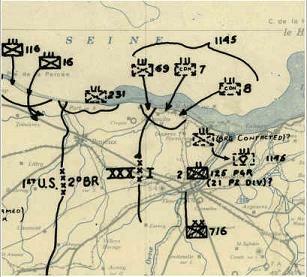 Maps showing daily troop positions from D-Day 6 June 1944 to 26 July 1945. Great source of photos and films. Pictures of the Second World War from the US National Archives. Producers of the Flames of War game system and an excellent range of 15mm models. A very fine ruleset according to Edwin! I Ain't Been Shot, Mum! A company level game from Too Fat Lardies. Fast play World War Two wargaming rules. John Moher’s page for "Rules and Organizations for Division-Level World War II Wargaming" by Arty Conliffe. Roll of Honour, Daily Reports, Air Power, Commanders, Units and Stations, Gallery. WWI and WWII airshow and military re-enactments in Blenheim, N.Z. Military and civilian aircraft with a New Zealand connection. Data on the Luftwaffe and links to related web sites. Plenty of information about the RNZAF in the Pacific and some excellent illustrations and photographs.